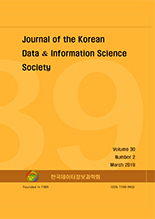 최경진, 이동원, 정봉주, 오경주,(2019).한국 국채 선물 시장에서 러프 집합 이론을 기반으로 한 투자전략의 최적화.한국데이터정보과학회지,30(2),271-283. 현재 금융 분야에 있어서, 실증적 연구는 대부분 주식을 이용한 최적 포트폴리오의 구성 또는 그 수익률의 제고 등, 주식 분야에 편중되어있으며, 반면 무위험 자산인 국채와 같은, 매크로 변수를 투자 대상으로 다룬 연구는 매우 미흡한 실정이다. 크레딧과 변동성의 분석을 필요로 하는 개별 주식 종목 투자와는 달리, 단기 채권은 일반인 투자자들에게도 접근이 용이한 상품이나, 낮은 연간 수익률로 인해 자산 증식의 효과가 미미하여 적극적인 투자대상으로 다루어지지 않는다. 본 논문은 러프 집합 이론을 바탕으로, 보다 다양한 투자 상품으로의 접근성을 재고함과 동시에, 국채 선물의 최적 투자 시점을 찾아 수익률을 향상시켜 적극적 투자의 대상으로 재발견하려고 한다. 본 연구에서는 15분, 30분, 50부느 그리고 일 단위의 데이터를 이용하여 최적의 투자 전략을 분석하고자 하였으며, 최종적으로 확인한 수익률을 통해, 국채선물 또한 훌륭한 적극적 투자의 대상이 될 수 있음을 확인하였다. In the current financial studies, empirical research is mostly focused on stock markets, such as constructing an optimal portfolio using stocks or improving its returns, while research on macroeconomic variables such as government bonds, which are risk-free assets, are insufficient. Unlike individual equity investments that require an analysis of credit and volatility, short-term bonds are easy to access for general investors, but are not actively invested because their asset growth is small due to low annual returns. Based on the rough set theory, this paper reconsidered KTB future as active investment by finding the optimal investment time and improving the return rate. In this study, we tried to analyze the optimal investment strategy using 15 min, 30 min, 60 min, and daily data, and confirmed that KTB futures could be an additional active investment tool proved by the final rate of return.